After announcing 110 film was making a comeback, Lomo announces a camera to go with it. The Fisheye Baby 110 is designed to work in the same way as the other fisheye cameras in Lomography's range, producing a full circle fisheye picture. Although its miniature proportions give the Fisheye Baby 110 a keyring like appearance, it is in fact a fully functioning camera which can be loaded with 110 film. Lomography brought back 110 film into its range a couple of weeks ago, with its first addition the Orca B/W 110. The firm says that it is planning to create more 110 films to go with the new camera. The camera comes into two models. The Fisheye Baby 110 Metal comes with an additional PC flash adaptor and comes wrapped in shiny metal. Specs, as with most Lomography cameras, are fairly minimal. The camera uses free-focusing and has just one aperture setting - f/8. It comes with a built-in viewfinder and can either be fired with a shutter speed of 1/100 seconds or used in bulb mode. The fisheye lens is 13mm in diameter and covers a 170 degree field of view. 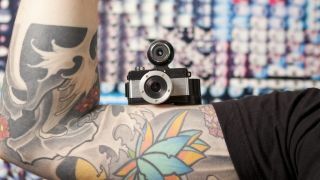 The Lomography Fisheye Baby 110 Basic will retail for around £35 ($54), while the metal version costs slightly more at £49 ($76). The video below has been designed to show how small the Fisheye Baby is... and how fish react to it.